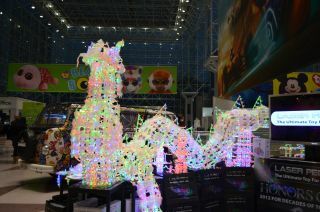 A dragon made of Laser Pegs LED light-up blocks was on display in the lobby at Toy Fair 2013. SPACE.com sought out the best in space- and science-themed toys at the show for our second annual Space Age Awards. Finalists and winners were chosen in six categories: Best High-Tech Toy, Sci-Fi on Earth, Cosmic Space, Little Scientists, Retro Future, and Do-it-Yourself Science. These wooden spacecraft models from Papa Foxtrot represent five real-life satelltes orbiting Earth. The sleek wooden design of these five new spacecraft models will please space enthusiasts as well as kids. Each figure represents a real satellite, including two capsules made by private companies contracted by NASA to deliver cargo to the International Space Station. SpaceX's Dragon, and Orbital Sciences' Cygnus, are reproduced in wooden miniature, complete with metallic solar arrays. The other models represent the Russian radio observatory Spektr-R, the U.S. reconnaissance satellite ORS-1, and the Japanese-U.S. magnetosphere probe GEOTAIL. This iPhone robot named Romo combines cool tech with a great robotic personality. Of all the robots showing off their skills at Toy Fair this year, Romo won our hearts with its combination of personality and robotics innovation. The roving robot displays a wide array of engaging expressions on any iPhone screen plugged into its base. It can be controlled from a nearby iPad, or even super-remotely from, say, Grandma halfway around the world connecting via a laptop. The robot can follow you around the house, play games, and even back up if you get too close. The remote-controlled K9 and Dalek from Underground Toys make a great "pet" for any 'Dr. Who' fan. Any fan of the long-running "Doctor Who" television series would want to command a 12-inch model of the show's robotic dog and extraterrestrial cyborg. These new remote-controlled toys would make great household "pets" or desk companions, bringing popular science fiction characters to "life" in the real world. This "MoonScope" from the Nancy B. 's Science Club line by Educational Insights is a great introductory telescope. This telescope is part of a new line aimed at girls that haven't yet discovered a love of science. The beginner's scope has the power to magnify objects in the sky up to 90 times, and comes with a special filter to reduce the glare from a full moon. A 22-page journal packaged with the instrument offers kids a host of experiments and suggested targets for their scope, such as the moons of Jupiter and the rings of Saturn, with examples of what those heavenly objects will look like through the lens. Kids can be chemists when they create their own markers in this new kit from Crayola. Kids can be chemists by creating their own Crayola markers in any color they like. This kit comes with dye for the three primary colors, and instructions for how to combine drops to create all the colors of the rainbow. Kids use their custom dye mixes as the cores of new markers they can assemble, complete with blank labels waiting for names for the new colors. Not only do kids learn color theory, but they get a sneak peek into how these popular art tools are made. These talking bears named Cody and Cora can learn kids' names and birthdays, and be updated as kids grow. These cuddly teddy bears harken back to retro toys like Teddy Ruxpin, but with a future twist. The talking cubs sing songs, tell stories and play games. But what sets these bears apart is their ability to be programmed to say children's names and even recognize birthdays through their internal clocks. The toys are meant to grow with children, and parents can update them with new phrases, stories and interactions as kids age out of old content. Plus they're pretty darn cute.